The word spread by mobile text message- I got mine from Uganda. Then later, Raphael Chikukwa also sent me a text. Reggae legend Lucky Dube is no more. He was gunned down yesterday in front of his children. Last I heard of his whereabouts, Lucky had moved to America where he felt safer than crime-ridden South Africa. It appears he moved back and the one thing that he was afraid of happened to him. Just a few days ago, I was thinking about searching for a copy of Getting Lucky, the movie that he starred in. Thinking of Lucky Dube always brings a smile on my face, because one of my nephews was convinced that I was in fact that worthy. The one time his mother asked me to babysit him, the little brat insisted that I do the stomping/toy-toyig dance routine on the video to Dube's That's the way it is. Tatenda's day was made when I was asked to pick him up from nursery school- he had told his mates that his uncle was Lucky Dube and they hadn't believed him, of course. They certainly did then, and their teacher humoured them. Tatenda and his family now live in South Africa, it has been nearly half a decade since I last saw them. I know his father was a Lucky Dube fan, and so no doubt he would be one too. If he still thinks Sekuru ("uncle") Masimba is Lucky Dube, I hope he doesn't think it's me that's been shot! Lucky Dube's death is a tragedy that outrages not only the Rastafarian community, but the entire civilised world. It comes in the wake of the recent killings of other South African artists, all in similar circumstances. It also exposes as a lie the image that South Africa is what the rest of Africa isn't but should be- wealthy, prosperous, secure, just. Oh, no, the plain truth emerging is that South Africa is no different from the killing fields of the Congo, Liberia etc. Mbeki and his government- basking in their smug little image of the "New South Africa" seem to think that this will all go way if they pretend that it is not there, or, if it is, it's not that bad. But then again, isn't that Mbeki's approach to things- look at the way he's handling Aids in his country, or his role as a mediator in Zimbabwe's crisis. Nelson Mandela was no better. So busy being celebrated as a symbol to the point of intertia. Recently, he went to London to see a statue of himself put up in Parliament Square. There, he lectured the Black community on violence and crime and was given column inches by all the papers. Look in your own backyard, Madiba! And whatever happened to Pagad? If they are taking donations, give me a call! 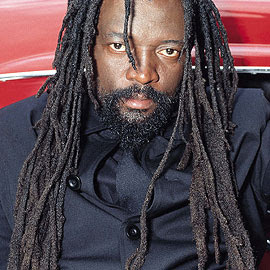 Rest in peace, Lucky Dube. Your music will live on. Those of us who remain must strive even harder for a world where there is not only security, but also the assurance of it.